15 D None No Power Seat 15 D is a standard Premium Economy seat that may have limited recline. 15 E None No Power Seat 15 E is a standard Premium Economy seat that may have limited recline. 15 F None No Power Seat 15 F is a standard Premium Economy seat that may have limited recline. 15 G None No Power Seat 15 G is a standard Premium Economy seat that may have limited recline. 27 A None No Power Seat 27 A is a standard Economy Class seat located in the last row of the section. Recline might be limited. The proximity to the lavatories might be bothersome. 27 B None No Power Seat 27 B is a standard Economy Class seat located in the last row of the section. Recline might be limited. The proximity to the lavatories might be bothersome. 27 C None No Power Seat 27 C is a standard Economy Class seat located in the last row of the section. Recline might be limited. The proximity to the lavatories might be bothersome. 27 D None No Power Seat 27 D is a standard Economy Class seat located in the last row of the section. Recline might be limited. The proximity to the lavatories might be bothersome. 27 E None No Power Seat 27 E is a standard Economy Class seat located in the last row of the section. Recline might be limited. The proximity to the lavatories might be bothersome. 27 F None No Power Seat 27 F is a standard Economy Class seat located in the last row of the section. Recline might be limited. The proximity to the lavatories might be bothersome. 27 G None No Power Seat 27 G is a standard Economy Class seat located in the last row of the section. Recline might be limited. The proximity to the lavatories might be bothersome. 27 H None No Power Seat 27 H is a standard Economy Class seat located in the last row of the section. Recline might be limited. The proximity to the lavatories might be bothersome. 27 K None No Power Seat 27 K is a standard Economy Class seat located in the last row of the section. Recline might be limited. The proximity to the lavatories might be bothersome. 28 D None No Power Seat 28 D is a standard Economy Class seat located at a bulkhead which might have additional legroom. The tray table and inflight entertainment monitor are in the armrest making the armrest immovable, therefore, slightly reducing seat width. The proximity to the lavatories might be bothersome. This is a bassinet location, therefore, a passenger with an infant might be seated here. There is no floor storage for this seat during takeoff and landing. 28 E None No Power Seat 28 E is a standard Economy Class seat located at a bulkhead which might have additional legroom. The tray table and inflight entertainment monitor are in the armrest making the armrest immovable, therefore, slightly reducing seat width. The proximity to the lavatories might be bothersome. This is a bassinet location, therefore, a passenger with an infant might be seated here. There is no floor storage for this seat during takeoff and landing. 28 F None No Power Seat 28 F is a standard Economy Class seat located at a bulkhead which might have additional legroom. The tray table and inflight entertainment monitor are in the armrest making the armrest immovable, therefore, slightly reducing seat width. The proximity to the lavatories might be bothersome. This is a bassinet location, therefore, a passenger with an infant might be seated here. There is no floor storage for this seat during takeoff and landing. 29 A None No Power Seat 29 A is a standard Economy Class seat located at an exit row and has extra legroom. There is no floor storage for use during takeoff and landing. The tray table and inflight entertainment monitor are in the armrest making the armrest immovable, therefore, slightly reducing seat width. The proximity to the lavatories might be bothersome. 29 B None No Power Seat 29 B is a standard Economy Class seat located at an exit row and has extra legroom. There is no floor storage for use during takeoff and landing. The tray table and inflight entertainment monitor are in the armrest making the armrest immovable, therefore, slightly reducing seat width. The proximity to the lavatories might be bothersome. 29 C None No Power Seat 29 C is a standard Economy Class seat located at an exit row and has extra legroom. There is no floor storage for use during takeoff and landing. The tray table and inflight entertainment monitor are in the armrest making the armrest immovable, therefore, slightly reducing seat width. The proximity to the lavatories might be bothersome. 29 G None No Power Seat 29 G is a standard Economy Class seat located at an exit row and has extra legroom. There is no floor storage for use during takeoff and landing. The tray table and inflight entertainment monitor are in the armrest making the armrest immovable, therefore, slightly reducing seat width. The proximity to the lavatories might be bothersome. 29 H None No Power Seat 29 H is a standard Economy Class seat located at an exit row and has extra legroom. There is no floor storage for use during takeoff and landing. The tray table and inflight entertainment monitor are in the armrest making the armrest immovable, therefore, slightly reducing seat width. The proximity to the lavatories might be bothersome. 29 K None No Power Seat 29 K is a standard Economy Class seat located at an exit row and has extra legroom. There is no floor storage for use during takeoff and landing. The tray table and inflight entertainment monitor are in the armrest making the armrest immovable, therefore, slightly reducing seat width. The proximity to the lavatories might be bothersome. 42 A None No Power Seat 42 A is a standard Economy Class seat. This seat is in the last row of the aircraft. Recline might be limited. The proximity to the lavatory and galleys might be bothersome. 42 B None No Power Seat 42 B is a standard Economy Class seat. This seat is in the last row of the aircraft. Recline might be limited. The proximity to the lavatory and galleys might be bothersome. 42 C None No Power Seat 42 C is a standard Economy Class seat. This seat is in the last row of the aircraft. Recline might be limited. The proximity to the lavatory and galleys might be bothersome. 42 D None No Power Seat 42 D is a standard Economy Class seat. The proximity to the lavatory and galley might be bothersome. 42 F None No Power Seat 42 F is a standard Economy Class seat. The proximity to the lavatory and galley might be bothersome. 42 G None No Power Seat 42 G is a standard Economy Class seat. This seat is in the last row of the aircraft. Recline might be limited. The proximity to the lavatory and galleys might be bothersome. 42 H None No Power Seat 42 H is a standard Economy Class seat. This seat is in the last row of the aircraft. Recline might be limited. The proximity to the lavatory and galleys might be bothersome. 42 K None No Power Seat 42 K is a standard Economy Class seat. This seat is in the last row of the aircraft. Recline might be limited. The proximity to the lavatory and galleys might be bothersome. 43 D None No Power Seat 43 D is a standard Economy Class seat. 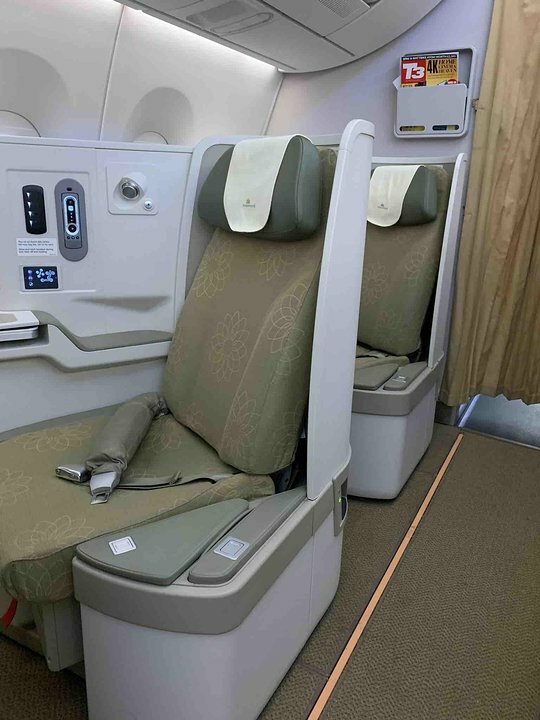 This seat is in the last row of the aircraft. Recline might be limited. The proximity to the lavatory and galleys might be bothersome. 43 E None No Power Seat 43 E is a standard Economy Class seat. This seat is in the last row of the aircraft. Recline might be limited. The proximity to the lavatory and galleys might be bothersome. 43 F None No Power Seat 43 F is a standard Economy Class seat. This seat is in the last row of the aircraft. Recline might be limited. The proximity to the lavatory and galleys might be bothersome. 7 D None No Power Seat 7 D is a standard Business Class seat. The proximity to the lavatory and galleys might be bothersome. 7 G None No Power Seat 7 G is a standard Business Class seat. The proximity to the lavatory and galleys might be bothersome. 7 K None No Power Seat 7 K is a standard Business Class seat. The proximity to the lavatory and galleys might be bothersome. 110-volt plug and USB power ports are available for use at every seat.